Sukhwinder Singh 2 years, 8 months ago. This is an UNOFFICIAL Micromax Nitro A310/A311 Resurrection Remix Marshmallow ROM. Current working and non-working status of this phone is not known at this moment and hence, please have my word of CAUTION before flashing this ROM and take a NANDROID backup of the current ROM on your phone. This unofficial Resurrection Remix for Micromax Nitro A310/A311 is brought to you by thpRock. Installing custom ROM requires a custom recovery to be installed on your device, which will VOID your warranty and may delete all your data. Neither the developer nor we can be held responsible for the consequences of installing this ROM. Understand that YOU are the ONLY PERSON making changes to your phone and you should do a research before going for flashing. TWRP 2.8.7 link for Micromax A310. Here is How to Install TWRP on Android using Fastboot. Philz recovery download link for Micromax A310. TWRP link for Micromax A311 by yogesh.kalyana. The above guide is for CyanogenMod and it should work fine for the Resurrection Remix ROM too as the RR ROM is based on CyanogenMod ROM. Make sure that you have a custom recovery installed on Canvas Nitro A310/A311. If not then download the recovery from above downloads section and you can follow this Custom recovery installation on any Android using Fastboot. 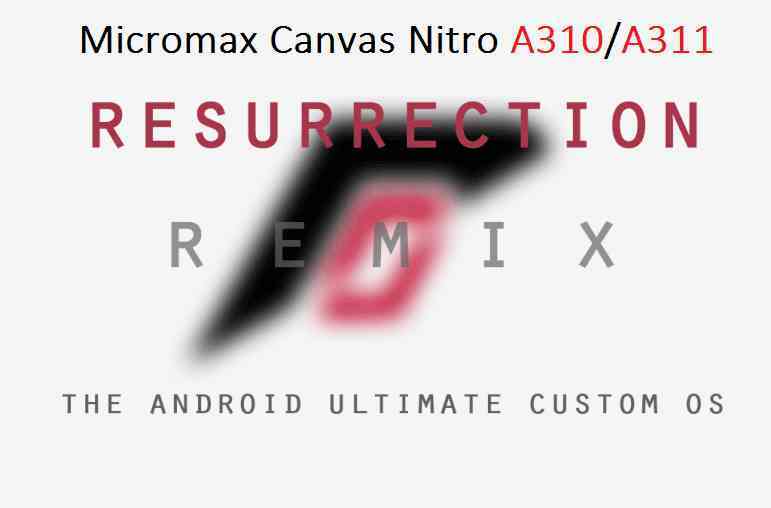 Download and Copy the GApps and Canvas Nitro A310/A311 Resurrection Remix ROM ZIP to your phone. Take a backup using a synchronization application or if you have TWRP installed then boot into TWRP recovery and take a NANDROID backup using the TWRP itself. This will delete all your data on your phone. IGNORE IF YOU DON’T WANT TO BACKUP OR IF YOU HAVE ALREADY DONE THIS. You may consider complete backup of your phone data or take a NANDROID backup of the current ROM. First flash the RR MM ROM ZIP from device. Then flash the GApps zip from your device memory. Reboot and Enjoy the Resurrection Remix Marshmallow ROM on your Canvas Nitro A310/A311. Copy the latest Canvas Nitro A310/A311 Resurrection Remix Marshmallow ROM ZIP file to your phone. Flash the latest RR MM ROM ZIP from your phone. Stay tuned or Subscribe to the Canvas Nitro A310/A311 forum For upcoming Android Nougat ROMs, CyanogenMod Custom ROMs, other ROMs and all other device specific topics. 1) phone is not rooted and i try with the provided link but still not rooted properly. 2) i am not able to change prefered network type 2g or 3g. 3) when ever i change my preffred sim for data connection, my mobile internet is not working, then i need to recheck all the settings, shutdown the phone, remove the both sim, insert again and then start, after these steps internet is working perfectly. Please guide me how to fix it.